Happy Holidays! Get Your Magical Kindle Ebook at No Cost While You Can! The Esoteric School wishes all a wonderful holiday season! In the spirit of the season, we are offering one of our Kindle ebooks (book 2 in the series) at no cost in the US and UK for today only! Grab your Kindle magic book while you can! Then take a look at the other books in the series and see all the magical skills you can learn in your own time and at your own pace. Just to give you an example of what you have to look forward to, here's an excerpt from Book 2 entitled Learn How to Do Witchcraft Rituals and Spells with Household Ingredients. Negative energy is something that can be dealt with through a variety of magic or witchcraft rituals. Using magical stones is a good way to ground out these unwanted energies. One stone in particular, called Grandmother's Tears or Apache Tears, is very effective at grounding out any excessive energy you no longer want. This stone is a special form of obsidian (volcanic black glass) made of feldspar, hornblend, biotite, and quartz. This stone looks opaque black in ordinary light, but appears translucent when held up to strong light. These stones have actually been spewed out from past volcanic explosions, and can be found in and around Superior, AZ. These stones are effective for grounding out excess or negative energies including anger, frustration, pain, or plain irritation. Grounding out these energies into Grandmother's Tears allows you to safely transfer these unwanted energies into the half worlds (a safe place for negative energies). Tribal people have been using these stones for generations for this purpose. Many practitioners use crystals for various types of healing work. However, crystals--and in particular quartz crystals--are easily contaminated, and need to be magically cleansed quite frequently. Because Grandmother's Tears do not actually "hold" energies transferred into them, but instead send those energies into the half worlds, these stones do not need to be cleansed unless desired by the practitioner. The stone acts as a portal to the half worlds, and none of that energy will come back to you. You can find Grandmother's Tears in most gem stores and in online stores. 1. Figure out whether your left or right hand is your dominant hand by simply pointing at an object in your vicinity. Whichever hand you used to point is your dominant hand. 2. Hold the Grandmother's Tear stone in your dominant hand. Use your intention to flow any unwanted energy into the stone, knowing that the energy will go straight into the half worlds, and will not "bounce back" to you. If you need help "flowing," just bring up every thought, feeling, or physical sensation related to the issue that is bothering you. Use your intention to "push" all these into the stone. 3. When you feel a sense of calm or peace, you may stop flowing energy into the stone. Alternately, the stone may feel warm, heavy, charged, or loaded. At that point, you know that your flowing is complete. Stop flowing and simply breathe, relax, and enjoy the sense of peace. 2. Bury the stone in the Earth for a Moon cycle (Mother Earth takes care of all kinds of energies, and is a great magical cleanser!). We hope you have a peaceful and joyful holiday season and New Year whatever traditions you celebrate. Now that you have seen the type of magical offerings you can receive in our Kindle book, we hope you will take a minute today and give yourself this free magical gift. You don't have to have a Kindle device. Any tablet, Smart phone or computer will work. It's only free today and only for Book 2 of the series so don't pass up your chance. The Tarot is a method of divination that gives you a direct way of obtaining information by psychic or magical means that are not available to the physical five senses. Magical divination can be used to direct our fates. By throwing tarot spreads for various situations in your life and interpreting tarot card meanings, you can discover the influences, energies and probability lines active in your life that pertain to the specific situation. With this information you can see what influences are affecting your situation and know where to make changes to affect the outcomes in your future lines if you want to. This is why the Tarot is such a valuable tool. Since the future is not pre-destined, you can change the future any time before it happens and using tarot spreads gives you the information you need to decide if and what you want to change. One of the ways we make Tarot readings more precise and more personalized to a particular person is to use a signifier card that represents and is keyed to a specific person or a specific issue, question or situation. Some of the information we use to select a signifier for a person are the Sun sign and the age of the person. There are exceptions to this method of selection, but it is a place to start. Here are the signs that correspond to the suit of card and age that relates to cards. As you can tell there is a lot involved in learning the Tarot, but it is a fascinating and fun magical study that can really pay off in giving you a way to take control of your future and your life. What a great gift to give yourself! Make it your New Year's resolution to learn the Tarot this year. It's easy to work into your own time and at your own pace with our online course. Just to whet your appetite, here is a sample of one of the techniques you'll learn in the Basic Magic Course. 1. Find a quiet place where you will not be distracted or interrupted. 2. Sit in the South facing North with your Firebowl in front of you. 3. You will not charge the Firebowl for divination purposes like you do for other purposes and a water incense is the best medium to burn as the Water element is the psychic element. 4. Start your incense burning in the Firebowl and wait until you have a good column of smoke going. Add more incense onto the charcoal disk if you need to in order to get a good column of smoke. 5. Hold an image of a person or object if they are connected to the information you are seeking and/or get very curious about the topic, question, person or object. 6. You can ask questions to increase your feeling of curiosity such as "Where is...? ", "Where was I in [name time period]? ", or What is likely to happen if I...?". 7. 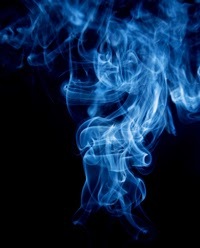 Peer into the column of smoke and look for images or visual clues to form. Some people find it easier to close their eyes when looking into the smoke to keep visual distraction out. 8. If you get an image, but not in enough detail to make sense to you, keep asking questions until it becomes clearer or you can ask the image to zoom in or out, shift left or shift right so that you can see more details in the "picture". Remember that the future is not set. Divinations into the future tell you what is likely to happen if everything stays the same in the present. That is one of the beauties of divination; being able to look ahead and make changes now if we don't like what we see. This is just one of the many magical techniques you'll learn in our Basic Magic Course. Give the Firebowl divination a try and let it help you remember how magical life can be when you use your magic training every day. It doesn't matter how long it's been since you practiced magic. It's never too late to get back on board. Whether you want to know how to invite an angel into your life or you want to discover the procedure for finding your animal totem, we have an entire library for you to browse. Want to know if personal gain is really banned in the use of magic? No, silly! Find out why. In addition to our library, check out the blog, our FB page, and our courses and ebooks and Kindle books. You got questions, and we've definitely got answers! 2. What exactly is real magic? Our answer is that magic is certainly real. It is the science of understanding and using Universal principles. Since everything in the Universe is made up of some mix of the four elements of air, fire, water, and earth, having an in-depth understanding of these elements is at the foundation of magical practice. What makes these elements magical is the understanding of how they operate not just on physical levels, but also on levels of mind and Spirit. For example, physical level Air is what we breathe. Magically, the Air element is the conduit for psychic communication, enlightenment, understanding, dreaming and more. If you want to attract any of these qualities then you need more magical Air. You can take on more of this element directly or by wearing Air colors such as white or sky blue. Understanding these elements and working with them directly allows us to understand, create or change anything we want to in the Universe. Magic has been taught as a precision science for thousands of years. Being a precision science means that the techniques are verifiable, repeatable and precise. In the past, the art and science of magic was taught just as math or science might have been and anyone can learn magical techniques. Today our society no longer puts the same emphasis on magic and it is not taught or even accepted as commonly as it was in the past. The most exposure we seem to get to magic these days is through fantasy shows, books and movies like Harry Potter. These are great fun and help to bring attention back to the world of magic, but the techniques are not always very accurate. For example, Harry and his friends use their Wands for just about everything. In reality the Wand is the tool that handles Air element energies only. It would actually explode if you tried to throw firebolts or fireballs with it. We're not saying that fireballs and firebolts can't be done. They are actually good for magical self-defense, but are made using Fire element energies and are better done by hand or using the Fire element tool, the Athame. What Can Real Magic Do? The bottom line on real magic however is up to each individual person. There are people who will not be able to learn and practice magic. For magic to be real you have to be able to suspend disbelief and have a willingness to not exercise contempt prior to investigation. In other words, one must be open to the belief that magic is real in order for the forces of magic to act. If you can suspend disbelief long enough to try magical techniques out for yourself then it can become real for you too. Seeing and experiencing it for yourself is the only way, as it should be, to develop a magical life. Don't take anyone else's word including ours that magic is real. Give it a try for yourself and through direct experience and observation you will be able to "prove" to yourself that magic is indeed real. A simple way to experience magic and your own magical abilities is working with clouds. 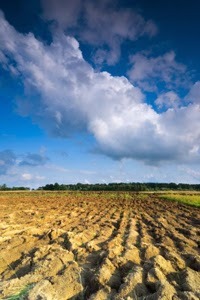 Clouds respond to your intention and can easily be moved, shaped and manipulated at a great distance away from you. If you could move clouds suspended hundreds of feet above you that would be quite a magical beginning wouldn't you say? Give it a try for yourself by sending a blank email to clouds@shamanschool.com. The directions will be sent to you right away. We don't use your email address to sign you up for anything or pass on to others so you have nothing to lose and just might gain a perspective into magic that will give you reason to want to explore living a magical life for yourself. The holiday season has arrived and with it has arrived crazed shoppers, family members (wanted or unwanted), work/life balance crises and more that can all interfere with your sacred space. But fear not! You, as a planetary citizen, are always entitled to your sacred space. To ward off those crazy holiday vibes, just key (personalize) and wear our specially designed seven-pointed faery star psychic shield. Watch those unwanted psychic energy bolts bounce off your now-shielded space. Moon shields for women, Sun shields for men. Both come with directions on how to key to your own energies. The Faery Star, also known as the Elven Star, is a seven point star made by combining a four point square with a three point triangle in a way that creates a constantly circulating shape or shield. This symbol is sacred to many Wiccan and tribal traditions because the number 7 is sacred as being related to the seven planets, seven notes of the diatonic scale, seven directions of North, South, East, West, above, below, and within, and the seven colors of the rainbow. This type of psychic shield once it is keyed becomes an eternally spinning shield. Whereas the pentagram which is a five point star always requires a "push" from outside to set in motion, once the Faery Star is keyed with electric blue energy it never stops rotating. A psychic shield is a great magical way to protect yourself from negative energies surrounding you. It will not only protect you from all the chaos and noise going on around you and create sacred space for yourself, but will also deflect the energy coming from another person thinking something negative about you. The energy from those types of thoughts from others can actually have a negative influence on you. When you key the shield, you are personalizing it to your own energies and programming it to defend against any kind or degree of psychic attack. An attack coming from behind you will cause the shield to channel the energy from it and pull it harmlessly through you. An attack coming from in front of you causes the shield to block the energy and scatter it. If you see your shield turning black or having burn or scorch marks on it, then you'll know it has been deflecting those negative energies for you. When this happens, just clean it up with silver polish and you may want to hold it over your firebowl with a mixture of pine resin and sage burning in it. Holding the shield over a column of smoke like this until the smoke begins to stick to it will help clear out negative energies too. Not only does the Faery Star shield protect you from unwanted energies, it also can help you control your magical gifts. Anytime you feel your energies spinning out of control, you can use the shield to ground your energies. Ward the mirror by putting the Left Eye of Horus symbol in the lower right hand corner of a square or rectangle shaped mirror. Use a permanent marker or a permanent sticker with the symbol on it. 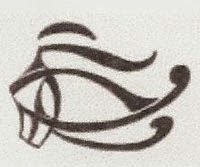 DO NOT use the Right Eye of Horus as that is used to enhance spirit vision, divination, opens things, seeks and pulls which is the opposite of protection. The Left Eye is a natural mirror and glass protector from Egyptian practice. If your mirror is round or oval shaped, put the symbol in the bottom center. Bind the mirror by using your Athame with a beam of electric blue energy projected off the tip and draw an X with the first line drawn from top right to bottom left and the second line drawn from top left to lower right. Lock both beams into the frame or the back of the mirror at the corners. Where ever you spend your holidays, whether staying at home or traveling, you can magically protect your sacred space and have a peaceful, joy filled time. 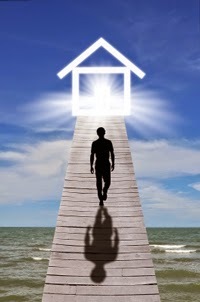 Energetically and magically clear out your space if you are at home or use a psychic shield at home or away from home and keep the negative energies out of your space. Especially at this time of year, whatever traditions you observe, you have sacred spiritual ceremonies and rituals that you don't want negativity interfering with. Just a little magic can help! Everyone has a "bad hair day" from time to time that has nothing to do with actual hair! A bad hair day is one of those days when nothing seems to go right, and everything that can go wrong, does! 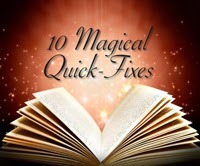 Luckily for you, right now you can sign up for our twice monthly newsletter and get our "10 Magical Quick Fixes" ebook at no cost. These 10 precious magical gems will help you smooth the wrinkles that pop up in everyday life. Here's just one example of what you'll find in the ebook... and remember this is a limited time offer so be sure to sign up soon! This is a good magical technique to use when faced with a big life decision that you just can't seem to make a decision about. It brings you guidance from your Spirit or Spirit guides to help you find the right answer for you. 1. Decide on a very specific question to ask. For example, you might ask, "Do I take this job or not?" or "Do I move to this state or not?" 2. Find a quiet place to just sit with this question in your mind for about 3 minutes and then ask the question out loud. 3. For the next 3 days, go about your business and put no more attention to the question or decision. If you find yourself starting to think about it, immediately move your attention to something else. 4. At the end of the 3rd day, ask the question out loud. The very first answer you hear is the one for you to accept. You may hear this answer from within yourself like a voice inside your head or from an outside source such as a song on the radio or part of a conversation between others that you overhear. Whatever way the answer comes, go with the very first answer. The more precise and concise you are with your question, the better this magic technique works. Also, be sure not to obsess or think about your question during the three days as that will interfere with the technique. This magical quick fix is a great way to transform hard decisions into easy ones. Part of living a magical life is about making things easier, so jump on board and sign up for the newsletter and no cost ebook to get started bringing magic into your life. Here is an example of one of the tips we offer in this course. On our spiritual journey through this life we have guides and teachers that open doorways for us, but we are the ones that have to get through the door. That's the real journey for us. When we try using force of will to try to get through the door, we are met with an equal and opposite force called resistance or second force. This is so by Universal Law and means that we cannot do and the more we try to do, the less we accomplish. Here's an example. There is something about yourself that you want to change. Maybe you gossip too much or eat too many sweets. So you decide on an aim of not talking or eating as much. But this usually leads to us talking or eating more actually because by Law of Attraction, that which we put our attention on is drawn to us. So if we are concentrating on NOT doing something that very thing is being attracted to us and manifests in our lives. It's a spiritual catch-22 that leaves us stuck. This is when a magical wish comes in handy. If we wish it with all our hearts then we do not create the resistance that wanting and attempting do. Wishing, holding the vision, creates an allowing force that pushes us through the door. It allows the Universe, angels, and other beings to work in our lives. When we wish, we are settling back within ourselves and feeling the desire we have, then just waiting. It's all about watching and seeing without forcing anything. When you were younger and wished upon a star, you were on the right track for manifestation. 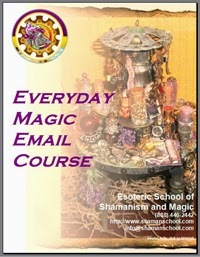 Whether you are wanting to renew your interest in magic or just beginning on a magical path, the Everyday Magic Email course is a great way to spend the next year immersing yourself in magical knowledge and magical techniques to try out. Want to Study Magic Now? Get Started at No Cost! Want to learn magic and magical things like how to invite angels into your life to help you with everything from what foods to eat to finding the perfect parking space? How about having the Spirit of Owl help you access knowledge that may be currently hidden from you? Get all of this and more by signing up for our newsletter and getting our no-cost 10 Magical Quick Fixes ebook. This is a limited time offer so get it while the getting is good! Here's a sample of one of the 10 techniques in the ebook that you can use to get a spiritual or energetic boost, clear away negative energies or to create sacred space for yourself. 2. Light the candle with your wooden or paper matches. 3. Let the flame grow steady and tall which we call a good "working" flame. 4. Now charge the candle by holding your hands so that they are close to (not too close that you get burned though) and cupped around the flame. 6. Now simply leave the candle burning for at least 30 minutes making sure it is on a plate or other protective surface and not a fire hazard. Once you feel ready and at least 30 minutes have passed, blow the candle out. Take a few moments to see if you feel a difference in your energy level and quality of your energy. Most people report they feel lighter, more harmonious and more peaceful. This is an example of the type of quick magic techniques that can help you in everyday life available to you in this limited time offer. So don't put it off, get to www.shamanschool.com, sign up for the newsletter and get your no-cost copy of the 10 Magical Quick Fixes ebook. Give the Gift of Magic this Thanksgiving! Here is a sample of one of the techniques you'll find in this series of books. This ritual uses standing water to magically clear negative energy and prevent nightmares. Since Water is the element connected with Spirit it is good for soaking up the Spirit's terrors. Using a magically programmed glass of water next to the bed before going to sleep will help many people avoid having nightmares by the water absorbing any negative spiritual energy throughout the night. For this ritual you will need a Sun Yellow candle, paper or wooden matches, a compass, a glass that is preferably a bright blue color, spring water and sea salt. After collecting these materials, you will need to program the glass of water each night. For this ritual follow these directions. 1. Locate the cardinal direction of West with the compass. (West is the direction of the Spirit). 2. After locating West, sit in that direction and face that direction. 4. Wait until you have a tall working flame on your candle. 5. Fill your glass halfway with spring water. 6. Add a sprinkle of sea salt. 7. Cup both your hands around the glass and flow Water Blue (bright blue, not a light or sky blue which is Air energy) energy through the glass in a clockwise direction from left hand to right hand and through the glass. 8. Continue flowing Water Blue energy into the glass this way for about 30 seconds. Don't think about the process just do it. 9. Move the glass so that it swirls the water in it gently in a clockwise direction while you breathe Water Blue energy in to the water in the glass. 10. In a voice of command say the following verse aloud. You will blow Water Blue energy into the glass before you begin to say the verse, after each line of the verse and at the end of the verse. As you say the verse continue to swirl the water in the glass in a clockwise direction. 12. 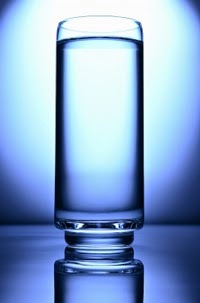 Now place the glass of water on a table or nightstand next to the bed close to where the person's head will be. 13. Blow out the candle. This water that is now "charged" will absorb thoughts and emotions that are released during the night and will block any nightmares coming from an outside source. When we sleep we are more spiritually open and this standing water is able to more easily absorb the negative energies that are responsible for nightmares. The next morning just pour the water out of the glass and down your sink drain. Do not drink it since it is now full of negative energy that you certainly don't want to absorb. People particularly troubled by nightmares may need to repeat this ritual for 40 nights in a row to make it a permanent solution. If you suffer from nightmares, give this ritual a try and we hope it gives you one more thing to add to your gratitude list this Thanksgiving. If you know someone else that could benefit from this ritual, pass it along. If you want to really give a gift of magic this Thanksgiving, consider sending one of our magical Kindle books to friends or family and let them discover what magic can do to enhance their lives. What Magical Knowledge Do You Want to Know? We love to stay in touch with our readers, clients and those in our online magical communities. If you've got a magical or shamanic question, our Facebook page is a great place to post it and share the magic online. Not only will you get the answer to your magic question, but other people get the benefit as well! If you haven't got a magical practice going, you may wonder why you would even want to have any magical knowledge and if you can really get magic online. The answer to the second part is yes. Magical resources we offer include the magical library, blog, ecourses, ebooks, Kindle books, online store of ritual supplies, newsletter and more! Here are a few answers to the first part as to what magical knowledge and developing a magical practice can do for you. Most people go through their lives in a mechanical state. In other words, they go through life reacting to the stimulus around them instead of choosing their thoughts and actions. Their thoughts and actions revolve around the things on their To Do list, family worries, social engagements and so on. We're not saying this is a bad thing, but it doesn't lend itself to raising your consciousness or the level of your being. Since the level of your being attracts the level of your life according to Universal law, living in this way doesn't nourish Spirit and doesn't allow you to attract anything higher. When you have a magical practice, the way you think changes and you have pauses built into your day that allow you to be conscious, aware of who you are and make connections with higher powers and beings. It also allows us to remember what we really want in life and moves us from living in a mechanical reactionary state to one that allows us to consciously respond to situations and people. Part of a magical practice is connecting with the Universe and higher powers and beings to co-create and manifest the things you want in life. Doing spells and rituals that quiet the mind or put us in touch with physical sensation bring us into contact with Spirit. Having contact with Spirit allows us to take time out from noise and hectic schedules to listen to our inner guidance. That is where the truth lies and the part of us that always knows what is right for us. When making decisions, most people spend a lot of time weighing pros and cons, gathering advice from others and worrying if they are making the right decision when all they really need to do is consult Spirit. If you were raised hearing things like "you have to keep your nose to the grindstone to succeed" and other hard work sayings, you may find getting what you want in life is hard work. It doesn't have to be that way however if you live with magic in your life. Part of that means having the help of higher powers and beings like angels, totems, and guides to aid you in manifesting those things you want in your life. A magical practice allows you to develop those relationships with higher beings and learn how to co-create with them. In a magical practice we quickly learn that doing spells and rituals designed in accordance with Universal principles is way more effective and safe than those that are not. Following the Rules of the Road that govern magical practice and principles such as "as above, so below" and four element principles make for a sound practice. Having this type of magic knowledge will enhance your aim. For example, if you are looking to gain knowledge in a situation, you'll want to work with the principles of the magical element Air whereas if you are in a situation that calls for action, you'll want to employ the principles of the magical element Fire. Now that you have a better idea what magical knowledge can do for you consider joining our tribe on Facebook and share the magic online. You can let us know there what magical topics you'd like to know about. If you're not on Facebook, shoot us an email and we can post your question and our answer for you. If you have started looking into the world of magic, you may be overwhelmed by all the different disciplines, traditions and types of magical practices that exist. So where do you begin? While looking around at magical topics you may have already discovered a discipline that has resonated with you or that you are attracted to. If so then great, you have an idea of where to start. If you haven't gotten that far then we invite you to explore our website and our blog that cover a variety of magical topics for ideas. One of the basics that is a good place to start to learn magic no matter what tradition or discipline you end up following is learning the four elements of Air, Fire, Water and Earth. Everything in the Universe is made up of some combination of the four elements of Air, Water, Fire and Earth. If you understand this and know how to work with these four elements, you can understand and create anything you wish to. This is the place we start with our students who want to learn magic because when we say the four elements are what everything is made up of that also applies to magical powers and abilities. For example, if you are drawn to and interested in developing your clairvoyant or telepathic abilities then you will want to work with your water element. Water is the language of Spirit. Any magical study you decide to pursue will advance by having an understanding of the four elements and which to work with in your chosen path. The four elements also help you learn to listen to Spirit guidance, live a more creative and peaceful life, understand the driving forces of life and follow your birth vision. How to Learn Magic: What Next? After getting a good working knowledge of the four elements, we can use our hands and bodies to conduct these energies for a variety of magical topics including self-defense, healing, divination and more. Each element also has a tool associated with it and we can learn magical techniques using these tools. The tool for the Air element is the Wand, for Fire the Athame, for Water the Chalice and for Earth the Plate. Then there is the Firebowl that almost every spiritual, magical and religious system throughout history has used in some form or fashion. This tool also sometimes called a thurible, can be used for cleansing, purification, to help in meditation and divination. After mastering the four elements and how to use them with and without magic tools, there are many different magical pathways you can decide to follow and various magical techniques that you can explore to see which ones interest you. For example, divination is the art of accessing information that is not directly available to the normal five senses. There are a variety of magic techniques to use for divination according to what information you are seeking. The Tarot, pendulum, scrying, I-Ching, and Runes are a few examples of divination techniques. And then of course there is spellwork to move into in your magical studies. A magic spell is a magical operation that combines the four elements in a particular way with a specific intention and can also have factors programmed into it to produce a specific result over a period of time. Chants, litanies, prayers, sonics, voodoo dolls (simulacra magic) and directors and limiters are all spells. Prayers are also spells. Spells are energy matrices programmed to build momentum and overcome obstacles until the end goal is manifested. Magic is a fascinating study that can change your life. It is important however to find a way to learn magic that will give you the skills and techniques, but also that teaches you how to use magic safely. For example, before you create a spell, you must also know how to work directors and limiters into it, understand basic magical operational laws and understand the terminology associated with spellwork. Otherwise your spell might work and reach the end result that you intended, but happen in a way that you did not intend to happen and can sometimes be disastrous. The Universe doesn't care what you intend, just what you actually do, so undertaking an operation without a good understanding of it can cause backlash to you. Magic is a precision science and altered procedures produce altered results. You can avoid this by studying under an experienced teacher. Our website gives you resources to get you started learning how to learn magic in a safe and effective way. From free articles to online courses and ebooks to magical materials and tools you need in our online store, we hope you find the offerings we provide at www.shamanschool.com a place to get you started exploring the wonderful world of magic. Moving forward in the series of our discovery guide to magic, we are now going to explore another aspect of the Navajo Beauty Way – the Walking Litany. A litany is a type of chant that is in effect a continuous walking spell that is used to create an effect on the person saying it. When you do the Walking Litany it puts a temporary three-dimensional energetic whirling protective magical shield up around you that can separate you from time, space and events and can be programmed to deflect certain types of energies and experiences by how it is keyed. Doing this litany can actually change the level of your being and by Universal law changing the level of your being changes the level of your life. This makes the Walking Litany a great magical tool. "With power around me, I walk in the world. With power within me, I walk in the world. This one carries power. This one walks in power." You can make changes in the verse according to what you want to accomplish. For example if you want to create a state of invisibility for yourself change the word "power" to invisibility. The Walking Litany is good for using anytime you feel a need to regain personal power or create a more positive state for yourself, or create sacred space. Having this litany as part of your magical toolbox gives you a powerful magic operation that can make remarkable changes in your life. As you start doing the Walking Litany and taking note of the changes it brings to your life, we invite you to join our magical community on Facebook and share your results. In this magical discovery guide series, we have focused on how to bring the higher into your life and establish a relationship with the Universe and its higher powers and beings. This allows you to explore all the magical possibilities open to you in your life and determine for yourself how magic can work in your life. A large part of making these connections and relationships is with daily rituals. This installment of the series, presents to you a contact ritual that is one of the three forms of the Navajo Beauty Way. This ritual is called The Exit Ritual and is used to contact and greet powers and beings. Whether you call your powers and beings Universe, God, Higher Power, Angels, Totem Spirits or so forth doesn't matter. This ritual simply lets you acknowledge that there are higher beings that exist and are available to help you. It also gives you a way to take a break during the day from all the noise, chaos and electromagnetic fields that surround us in our daily lives. The Exit Ritual can help realign your chi or life force and bring you a sense of peace and serenity. 1. Extend your focus upward into the sky to establish contact and say aloud, "Sky Above." 2. Keep your awareness focused above you and also extend your focus into the Earth saying aloud, "And Earth Below." 3. Maintain your awareness above and below and say aloud, "I Greet You." 4. Wait for a moment and be aware of anything that happens. Watch for any type of acknowledgement or response. 5. If you are not too self-conscious doing the Exit Ritual in a public place, you can also use arm gestures. 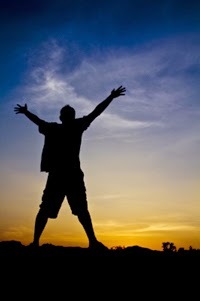 For "Sky Above" raise your arms in an upward facing V and for "Earth Below" lower your arms with the V facing downwards. Responses to the Exit Ritual can vary from person to person and from each time you do it. You may notice a change within yourself such as a sudden realization or insight, an attitude change or a new awareness. There might be a change in the space around you such as a breeze, change in sky color or a bird or animal nearby becoming very noticeable to you. You might hear a voice in your head providing you an answer to a question you have or guidance on a problem or issue you face. The response may just be something that happens at the moment you complete the Exit Ritual or it could be something that stays with you the rest of the day. Not only can it change the day you are having, but by making this a daily ritual, you establish a connection with the Universe and invite wonderful and magical changes into your whole life. You've nothing to lose by giving it a try and see what happens for you. Then if you're ready to let more magic into your life, check out our Witchcraft Spell Books series on Amazon. 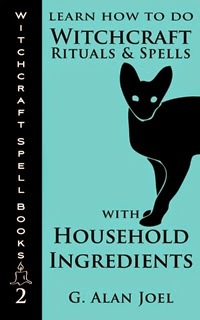 The first three books provide you with magical offerings using your bare hands, magical tools and household ingredients. The 4th book is a compilation of those three. Start with the Exit Ritual and begin establishing your relationship with higher powers and beings and you'll be well on your way to preparing yourself for a magical lifestyle. There is no problem that cannot be solved magically. At the level of life, we sometimes paint ourselves into a corner, get that feeling that there is "no way out." Say goodbye to the feeling of hopelessness. Magic is all about reaching up to a higher level of life, and higher beings, for whom miracles are everyday occurrences. As Einstein said, the solution to any problem never exists on the same level. The solution exists on the next level up. Here are three basic rituals that you can try out for yourself to connect with the higher and reach up for a higher level of life. Today – Begin working with the Universe as a co-creator. Take the first step by making contact and ask the Universe to manifest something today, from cherries to the word NASA. For more on how to do this see the blog article here. This Week - Ask Owl about a loophole or blind spot in your current solution. Not sure how to work with the Spirit of Owl? Check out this article. This Month – Do a come-along with a Sun Candle reinforced by a talisman and a mantra you create. Add the talisman and mantra onto the come along when you burn the Sun Candle for 30 minutes each day. Haven't done a come-along before? See the directions in this article. By starting to use these simple daily rituals and work them into your life, you will begin establishing a magical relationship with the Universe and higher level beings. You will soon find that by making these a part of your everyday life the level of your own being will increase. And magically speaking you know that the level of your being attracts the level of your life. That's a well-known magical principle. So the higher your being, the higher the level of life you will attract. That's how magic works! For more daily rituals get our Daily Rituals for Attracting What you Want in Life ebook. 36 more simple daily rituals offered in it will help keep you on the path of magical discovery. If you've been following our 5 part series on "5 Reasons We Don't Get What We Want", then you know we concluded it in our last newsletter article. Now comes the fun part! It's time to hear what you have to say. Take a look at the last 4 articles on our blog and the newsletter article if you need a reminder about the 5 reasons we identified that keeps people from getting everything they want delivered to them by the Universe simply for the asking. Now as I said, we'd like to hear from you. Let us know which of those reasons have been preventing you from manifesting what you want, if you have done anything magical to deal with it, or anything else that you think about the reasons we came up with. Email your response to info@shamanschool.com and one answer will be selected for the recipient to receive a free copy of our "Witchcraft Spell Book: The Complete Guide of Witchcraft Rituals & Spells for Beginners". We will announce the winner by first name only and not use your email address of course, on our Facebook page October 31. Halloween, how appropriate! We may also want to post responses on our blog or Facebook page, but won't use names or any sensitive information in doing so. Ready to chime in and share your 2 cents? We'll be waiting to hear from you. The past few blog articles have been the beginning of this series in which we have discussed how daily rituals, like those found in our Daily Rituals for Attracting What You Want in Life ebook, can help us stay connected with the Universe and higher beings to become co-creators in getting what we want in life. Master teachers have taught the principle for ages that you need only ask the Universe and prepare yourself to receive as it delivers. There are 5 main reasons that we've identified that people aren't able to follow this simple principle and get all that they want. Three of these reasons we covered in depth in the first 3 parts of this series. Here we will explore another of those reasons, "Negativity is Popular". In the next article we will cover the last reason and then turn it over to you to see what you think. You'll also have a chance to receive a magical gift from us for putting in your two cents. Your first reaction to this may be, "What!? I'm not attracted to negativity!" But think about what sells in our society. You occasionally see a nice human interest story on the news, but most of it is all about the negative things going on. Same with movies, TV shows and workplace gossip. All these things that attract people and their attention are in the negative realms. If you have studied metaphysical principles then you are probably familiar with the one that says we attract to our lives that which we focus on and put our attention towards. Our thoughts and feelings (negative and positive) attract the people and events that we have in our lives. The simple solution therefore would be to only have positive thoughts and feelings and only attract positive things, right? There's where the problem lies. Since we are surrounded by negative influences and perhaps even ridiculed as being a Pollyanna if we don't join in, it is difficult to stay in a positive space. We may not even be consciously aware of all the negativity that surrounds us since it is so prevalent that we have just grown accustomed to it. Luckily we can use daily rituals to move ourselves away from negative influences and attract people and events that have the same positive outlook that we embrace. Doing daily rituals can give us the courage and confidence to be in the positive flow of consciousness instead of a negative one. Being in this state also nourishes the part of us that can remember our dreams and feel in alignment with them. Putting in a little time every day to connect with the Universe and higher beings will go a long way towards being able to stay in a positive frame and give up the addiction to negativity. In Part I and Part II of this series we discussed how daily rituals, like those found in our Daily Rituals for Attracting What You Want in Life ebook, can help us connect with the Universe and higher beings to create manifestations of everything we want in life. This magical truth has been taught by master teachers for ages and it's all about simply asking the Universe and preparing ourselves to receive the delivery. We've identified 5 main reasons however that people aren't able to follow this simple recipe for getting everything they want and covered two of them in depth. Here in Part III of the series we explore another of those reasons, "We Are Hypnotized by Daily Life". Over the next few weeks, we'll explore the other reasons on our list. Then it will be your turn to give some input on what you think about these reasons and have a chance to receive a magical gift from us. Most people go through life in a pretty mechanical state rather than living in consciousness. We are so hypnotized by our daily lives with our schedules, commitments, to-do lists, etc. that we don't consciously create. Test it out for yourself and take a few minutes first thing in the morning and last thing at night to observe your thoughts. You will probably find they are about what you have to do today, or things that happened to you during the day. The big desires and dreams that you have probably aren't part of those thoughts. We go through our routines, our have-to's and shoulds almost like robots. Have you ever been driving to work and suddenly realize you are there without remembering the drive hardly at all. Talk about mechanical and robotic! Taking the time to make daily rituals a priority in our lives allow us to create contact with Spirit and keep that contact going all day. Spirit is the keeper of our dreams, desires and lessons we came to Earth in physical bodies to learn. That part of ourselves that stays in touch with our spirit path and goes through our lives daily with purpose and meaning needs to be nurtured. Daily rituals don't have to be real time consuming or complicated and making them a priority allows us to break out of the mechanical state and become Spirit-led and achieve our dreams. You can magically break out of the hypnotic state of life, live more consciously and become a co-creator with the Universe to get everything you want.